Lindsey Pulliam tries to navigate the defense. The freshman guard and the Wildcats had trouble navigating their way to win at Penn State on Wednesday. Pallas Kunaiyi-Akpanah has never been down this road before. 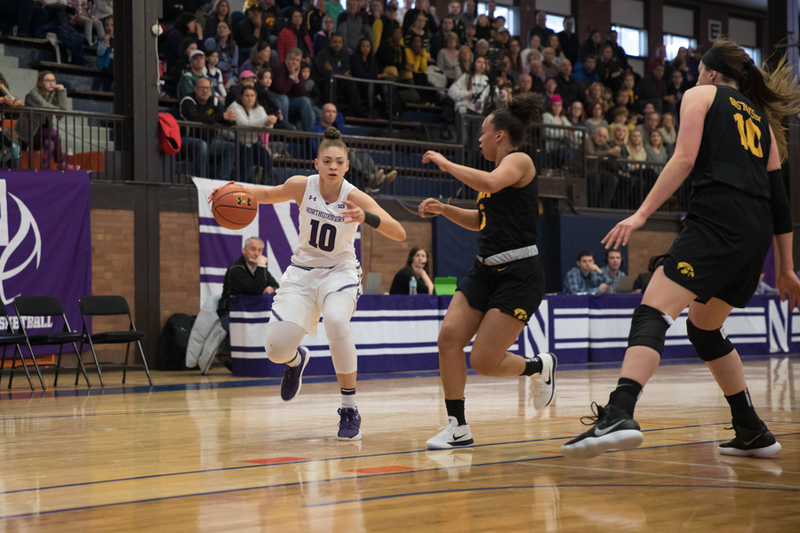 The junior forward hasn’t experienced a losing season at Northwestern, and her impressive rebounding and shot-blocking skills helped propel her high school team to finish as state runner-ups. But this season, the Wildcats (9-18, 2-11 Big Ten) have been demanding Kunaiyi-Akpanah do something completely different — score. And despite her 21 points and 14 rebounds Wednesday night, NU lost its eighth consecutive game in a 67-59 contest against Penn State (15-12, 6-8). During the preseason, coach Joe McKeown said he anticipated Kunaiyi-Akpanah, who averaged 1.6 points per game last season, to become one of the best rebounders in the Big Ten. The junior became the third player in program history to collect 300 rebounds over the season Wednesday. But McKeown said he didn’t expect Kunaiyi-Akpanah, who now scores 11 points per game, to become the Cats’ most consistent source of offense when they are struggling to score. After trailing by double digits in the second quarter, she scored 12 consecutive points for NU spanning the second and third quarters and paced the Cats to a 13-point lead. McKeown said her intensity gave them a chance to win their first conference game in a month. But NU’s struggles in conference play, especially to start games, haven’t been alleviated by Kunaiyi-Akpanah’s growth. The Cats dug themselves another sizeable hole in the first quarter by scoring only seven points in the first ten minutes, and despite the junior forward’s run that followed, they were unable to maintain a level of play which would have led to a victory. For the second consecutive game, freshmen guards Lindsey Pulliam and Jordan Hamilton struggled to provide an offensive spark as the duo combined to shoot 7-for-25 from the field. In the two games following Pulliam’s 33-point outing against Indiana, she has averaged less than 12 points per game. Kunaiyi-Akpanah said she is trying to help her younger teammates to become more confident. Even after a disappointing showing by the backcourt in a game McKeown said the Cats should have won, he said he didn’t feel the need to say much in the locker room. Turnovers and defensive rotations, he said, cannot be fixed on the fly. Kunaiyi-Akpanah said it is her responsibility to take her teammates under her wing. NU’s physicality might suffer without her, McKeown said, and he is relying on the junior and the other upperclassmen to maintain team chemistry throughout this difficult stretch.